Unfortunately, a live post-fight press conference stream for “UFC 137: Penn vs. Diaz” will not be made available. Clearly, the next best thing is a live blog hosted by yours truly. Nick Diaz defeated BJ Penn in the card’s featured contest. Not only did Diaz leave the Mandalay Bay Events Center in Las Vegas, Nevada victorious, but he also may have retired Penn in the process. For complete results of UFC 137, check out our play-by-play coverage HERE. Penn was taken to the hospital and did not attend the press conference. 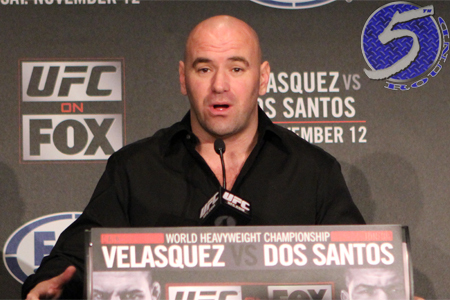 According to UFC president Dana White (Pictured), 10,313 fans packed the arena, garnering $3.9 million at the gate. White: Diaz is a real fighter and people like real fighters. He’s the real deal. Not sure if Diaz’s personality is good for the sport, but he just wants Nick to be Nick. White giving Mirko “Cro Cop” Filipovic props on his career. It’s a young man’s game. White not sure if Penn will still retire. White didn’t get to talk to Cro Cop or Penn. CC was upset and Penn straight to hospital. Dana just said he has a special announcement to make, but won’t do it until Diaz gets here. Hmm … GSP??? Nelson wanted to shave his beard to give media something to talk about on Monday. “Big Country” refuses to reveal how he lost his weight or why he kept everything a secret leading up to today. Cerrone still wants to fight Nam Phan at featherweight, but he isn’t leaving 155. Hioki wasn’t sure if he won the 3rdRound, he admits he could have lost the decision. Kongo says Cain Velasquez got lucky in their first meeting because he took it on short notice and didn’t have his legs. It’s been five fights and would like a rematch. He said it respectfully, though. Diaz still isn’t here and White says the NSAC is still waiting for him to submit his post-fight drug test. Nelson didn’t worry about his two-fight losing streak entering the bout. He just wanted to give it his all. Diaz is in the house! Diaz thinks he put on a poor performance. He didn’t fight a smart fight. He wasn’t 100 percent today. He went through hard times leading up to this scrap. Diaz’s right eye is BUSTED UP. White said he’s happy with Diaz’s performance and though the fight was amazing. Diaz did everything he was supposed to do, but he didn’t feel good about it. Diaz says it was hard to find sparring partners because they aren’t compensated enough, and he understands. Diaz says Penn was never his idol, but he just liked his style. Diaz admitted that he had to find something to fight BJ about. He says he wasn’t motivated for this fight because he was cool with Penn in the past. Diaz wasn’t as motivated because he didn’t figth Georges St-Pierre like he was supposed to. That’s why is face is so battered. He says GSP should want to fight the Strikeforce champ and unify the titles. But he admits he’s “not important” enough. Diaz says GSP is a good fighter and a good role model. White: GSP is pissed and thinks Diaz is the most disrespectful fighter ever. He wants to put on the worst beating on him. It’s on: GSP vs. Diaz on Super Bowl weekend. Carlos Condit agreed to step aside and will compete on the same card. Diaz is now saying the stoppage on Jake Shields (vs. Jake Ellenberger) was bad. White: Condit was given an option to bow out, not ordered. He will get next dibs, but needs to win on Super Bowl card – whoever he fights. Diaz wasn’t able to spar with Andre Ward because he got cut. Other boxers were asking for too much money. Diaz likes to run from his bad neighborhood into these nice neighborhoods with nice houses as motivation. Dana says Nick should have enough money to buy a nice house, but Diaz says he doesn’t have enough time to look for a house. If he would have pulled out like GSP did, he might have time to look for a nice house. Got really irritated. Diaz says that if Penn would have trained with him he would have been in shape for this fight. Diaz isn’t happy at all with tonight. He’s pissed he had to fight someone that he might have been friends with in the past. Penn had footage on him when they trained together. That’s why he doesn’t want to make friends. Even though he got a title shot, he’s not happy.